Jim Pashek just completed the second of two certificate trainings managed by the National Charrette Institute (NCI). This second training, held in beautiful Vancouver, BC, focused on the logistics of planning and running the NCI charrette process. Bill Lennertz, Executive Director of NCI indicated that this was the “masters” class for those who really want to get into the nuts and bolts of how to set up a room, manage challenging public meeting participants and build in successful elements of a great charrette. Marcy McInelly, founder of Urbsworks and charrette consultant shared her experiences in a very useful debrief of a major charrette held in Colorado recently. It was really helpful to learn what worked and what did not. They realized that the charrette activities were better suited for five days or more to ensure quality feedback loops and room to shift gears mid-course if needed. The challenge for many of our clients and colleagues is the attempt to use parts of the NCI charrette process without understanding the implications of shortening or eliminating portions of the process. 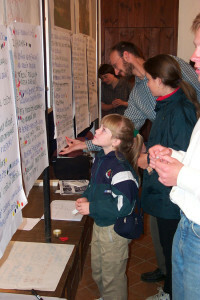 Typical charrette processes involve about 50% of the work leading up to the charrette week and an important amount devoted to post-charrette work. If you are interested or would like to know more about building a charrette process, the common pitfalls and the elements of successful charrettes, send Jim an email at jpashek@pashekla.com. When is a Charrette Appropriate? Jim Pashek recently attended a Charrette planning workshop sponsored by the National Charrette Institute (NCI) and Harvard Graduate School of Design. The Charrette, typically involving 6-9 months of activities, centered around an intensive 7 day workshop has been used to bring together disparate viewpoints, build consensus, and generate products that can often move forward projects that may have been on hold for years. Although there are usually months devoted to workshop preparation, often including a public meeting, the heart is the seven day charrette. This involves representatives from all sides of an issue, at least three “feedback loops” to make sure the proposals at the end are incorporating stakeholder views and a range of professional participants depending on the type of project. It is not unusual to have at the seven day charrette, 12- 15 professionals, from land use planners, architects, landscape architects, illustrators, economists, developers, engineers and ecologists. The cost of a charrette obviously varies depending on the complexity of the project. The NCI suggests that these charrettes often cost from as little as $125,000 to more than $350,000 for very complex projects. Because we were in Cambridge for the training, we had the added benefit of a session with Stacie Smith from the Consensus Building Institute (CBI). The Institute, who started as a group of professors at MIT and who authored the book “Getting to Yes,” have developed an interesting process for getting groups with polarized positions to identify common values that they can build on (the CBI is just beginning to do work in the middle east). 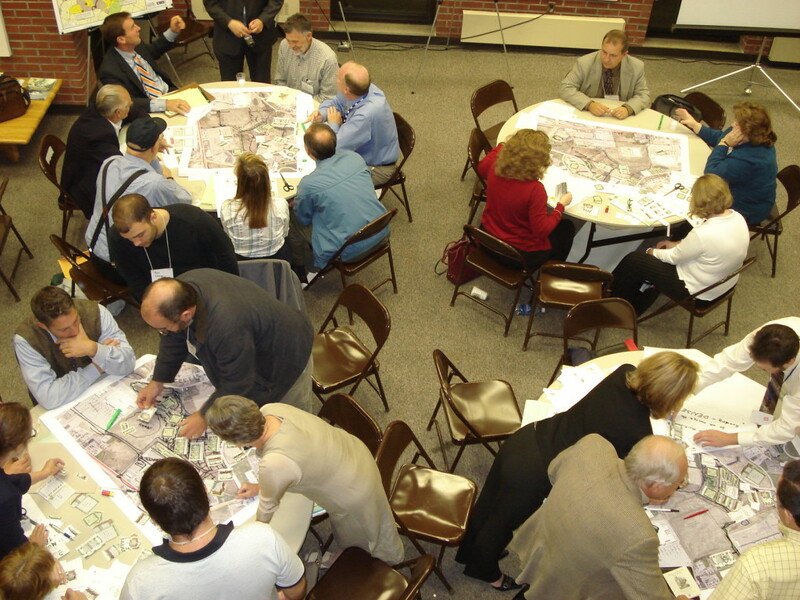 There are situations when viewpoints are so entrenched that consensus building might be a more appropriate process than a charrette. Other times, this process might be a logical precursor to a charrette workshop. The NCI has great resources for agencies including a standard scope of work for running a charrette process. Check out www.charretteinstitute.orgor call them at 503-233-8486. I would encourage everyone to become more familiar with this great public process tool and consider using it in the appropriate situation. Anyone who is interested in more information could also give Jim Pashek a call at 412-321-6362 x111.